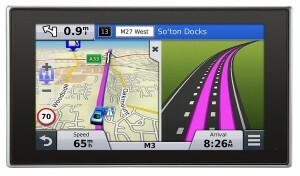 The Garmin Nuvi 3597LMT continues to refine Garmin’s brand of navigation with premium design and incredible interfaces. Although it is not quite the top of Garmin’s current sat nav range, it does boast of one of the best interfaces in the business. 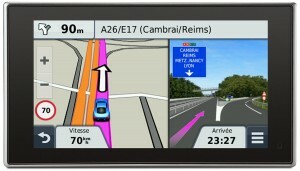 With a 5-inch display, the Garmin Car 3597 comes with a 800 x 480 resolution nestled in a stylishly thin frame. The edges are tapered making it easier to slip in and out of a pocket. The built-in speaker isn’t amazing hence necessitating its use in its suction mount which does come with a more powerful built-in speaker complete with a pleasant sound output. The magnetic mount has a tendency of grabbing strongly enough to hold the device in place on the windshield or dashboard, while at the same time letting go easily when the unit needs to be taken off. The device can be used in either horizontal or vertical orientation and it does come with maps for 45 European countries and lifetime updates across all of them. The updates do include POIs, routes and navigation info up to four times per year for the life of the device. There has been an update to the Real-time traffic software. It is now possible to bring up a large display on the right, which display indicates an upcoming delay ,how far along on the trip it is, how long it is and the amount of time a suggested reroute would save in this scenario. In terms of performance, the Garmin 3597LMT comes with a slightly different user interface as compared to other Sat Nav units of its kind. For example, there is an increase in size with regard to the distance icon and upcoming turn located on the top left. In addition, the map graphics are splendid looking and voice activated searches can be done, although it may be a hit or miss. The Nuvi 3597LMT features wireless connectivity with a smartphone via Bluetooth, which connection enables hands-free calling using the PND’s microphone and speakers. It also comes with a great hands-free voice command system. The Apps menu that comes with this Sat Nav facilitates the customization of the Voice Command trigger phrase, proves a travel history view and the last place the car stopped, pairing a phone via Bluetooth in order to utilize the sat-nav as a hands free device and configuring and accessing the ecoRoute system, which helps in minimizing fuel usage. 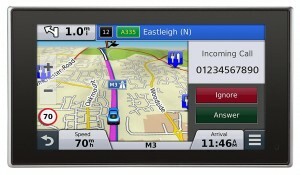 This sat nav boasts of approximately two hours of battery life, a Mini-USB port for charging the unit and updating software by way of an internet-connected computer and a very tiny integrated speaker at the back of a drilled grille. It also comes with a microSD card slot and a glass that can register pinches and swipes in much the same way as it would taps. The Nuvi 3597LMT comes with a USB cable, a combination power cable and traffic receiver, a vehicle suction cup mount and a Quick start manual in its package.